So Why Would You Want To Waterproof Your Home Electricity Monitor's Transmitter? Well when you're looking at monitoring electricity generated by your Solar PV, you may be faced with the problem of having to site your home electricity monitor's transmitter, out in the weather. Knowing at the same time, the transmitter is not waterproof! So What Can You Do To Waterproof Your Transmitter? Well a common solution is to wrap the transmitter in plastic bags and tape. The only problem being here, is this solution could be very temporary for many reasons, resulting in a damaged transmitter. We have found a simple solution, that eliminates those plastic bags and at the same time provides a 100% waterproof solution. 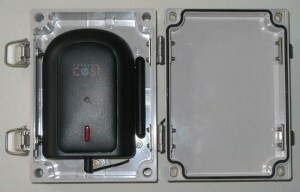 The transmitter is placed inside it's own waterproof plastic box. Such a box is available from Jaycar Electronics and is suitable for both the Current Cost ENVI & ENVIR Home Electricity Monitor's transmitters. The Jaycar Electronic's part number being HB6402, costing AUD $19.95. The box comes with a waterproof seal in the lid and strong clips to keep it tightly closed. With a little invention it would not be too hard, to drill a hole in either side of the box and during any solar PV installation, pass the cable from the solar array through the box. This would allow for the current clamp to be inside the box as well. If you decide to look into this option, you may need to choose a larger box. Whilst working with the idea of waterproofing the Current Cost transmitter, we noticed that our test transmitter's range was considerably extended, whilst outside of the metal powerbox. In fact we extended the range of the transmitter [by line of sight] to over it's maximum of 100 metres. After considerable testing of the Current Cost's transmitter's range, whilst in the metal clad powerbox, we found the range to be around 32 metres. Once outside of the powerbox and in the plastic box, the range was extended by a staggering 82 metres to a total of 112 metres. We noted the stronger signal allowed us to monitor the electricity usage, at areas inside and out of the home, where previously we had no signal. Our tests were run twice with a portable battery supply powering the monitor. This allowing for very accurate signal patterns to be created around the home at six second intervals. This interval being the transmitter's transmit sequence. What we ended up doing after this finding, was to install the transmitter permanently outside of the metal powerbox. We aligned the holes both in the back of the plastic box with those on top of the powerbox. The holes between the two, being sealed with a plastic ferule and locknut and added sealant. 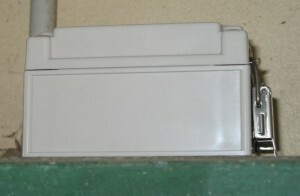 If your powerbox is open to the elements, then a decision to mount the plastic box on the top, side or bottom of the powerbox will have to be made. One that provides the best waterproof solution. So for only $20 you now have a waterproof solution to monitoring your alternative energy source and keeping your home energy monitor's transmitter range to it's maximum. Further information on the home electricity monitors capabilities can be found on our website Aussie Home Energy.